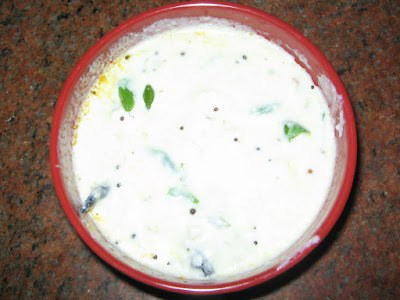 Mix grated raw coconut with curds and add salt. Then place a kadai on the stove,add oil,after heating add the seasoning materials. Switch it off after it crackles,let it cool for 5 min. Add the seasoning to the curds and mix well. It should be placed in fridge and should be cool in summer. Or it may turn sour if it is kept outside for a long time. I do this often whenever i have more raw coconut.